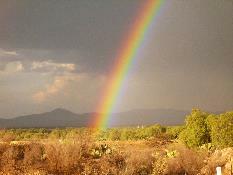 Find your pot of gold on a Mexican highway. Taking your dogs or cats to Mexico is no problem. Taking your pet birds to Mexico is difficult, but not impossible. Some great customers who consulted with me about moving to Mexico gave me the contact person with the USDA and contacts with Mexico that will help you import your birds if it is possible. Some species are still prohibited. Steve Sims, a helpful reader gve me links to the most up-to-date info from the Mexican government sites. Their authority supercedes anything I might say if there is any difference. BTW, the best way to find pet-friendly hotels is to use the Booking.com link on the side of all my pages. They have a filter for pet-friendly on their site. Reptiles are prohibited (though someone read this and said he takes his pet turtle, so I may be wrong, but that is the official stand). Dogs or cats only need a heath certificate from a US veterinarian stating that they are healthy (duh), proof of vaccinations and that is it. This health certificate for your pet is supposed to be notarized, but it is very seldom even asked for. But, if you are asked for it and do not have it, you will be sent back to the USA, so get the pet health certificate anyway. The all-in-one vaccination is DHLP-P for dogs. For cats, you should have both FVRCP-P as well as feline leukemia shots. Oh yeah, I would be remiss if I did not tell you that technically, your pets are supposed to have certificates from the Mexican agricultural department. There are offices at most border crossings, but it has been my experience that they are seldom manned. I asked one time about getting the permit for my dog and was told, Si, you could get one, but the inspector is not here right now. Maybe manana. Maybe this week. So, I have never known anyone who drove to Mexico who got that permit, but had to tell you. When you fly in, it is a different story. Then you will get to meet the agricultural inspectors. However, there is a legal limit of three pets per person. More you can bring by paying a fee of over 2,000 pesos. Is it enforced? Although I know a woman who was in animal rescue and brought 32 dogs and cats, a number of goats and a few horses with her when she moved back to Guadalajara, I suspect she was lucky. I also know a gringa in Pto. Vallarta who spent $2,000 and a lot of heartache trying to get her 3 cats (originally from Mexico) back with her when she flew back from Canada. Some customs officers say you can only have one pet per person. What do you do? You pay a small fee for a permit. It is not a lot, though I don't have the exact amount. Choose which story you want to believe. Taking some birds to Mexico is, doable, you just have to have patience. This changes now and again. Birds that are native to Mexico (parrotlets, Amazons, some macaws [military, scarlet for sure] some parakeets, toucans, and maybe some others) are not allowed. Things have been more difficult since Oct. 14, 2008, when a law was passed so that no birds native to Mexico may be imported. Period. If you want to know more, read on. A source for the Mexico official info is: The Secretary of the Interior's Office: 011-52-555-905-1013 or 011-52-555-905-1020. Bringing our bird to Mexico was a complete success. Our papers were in order & checked 3 times, everything was good. Jose Blanco was a very nice man with US Fish & Wildlife in Laredo,1-956-286-9961 or 1-956-726-2234. He knows the protocol. The first step to bringing a bird to Mexico is to obtain the cites permit from fish & wildlife us side. This can take up to 90 days. It took us about 45 days, but the Xmas holidays were in progress. Jose Blanco can fill you in on that, I think that comes from Washington. The title is Cites Convention on International Trade in Endangered Species of Wild Fauna and Flora. I'm not sure if this is any help to you. We used the web site for the bird www.aphis.usda.gov. We got his [their bird's] cita from aphis, which took about 45 days & then had testing for influenza etc. Then I took that to Austin. You should get the cita first & USDA approval 10 days prior to leaving the country. You also have to have the bird & paper work inspected in Laredo. I think it's this side with fish & wildlife. You need to make an appointment 3 days before traveling with Jose Blanco. We are relying on his instructions as well as aphis & USDA We have triple checked everything but will do another check to be sure. It is probably a good idea to immunize puppies against the parvovirus, which is common on the South Texas border and in some parts of Mexico. All age dogs should be protected against Ehrlichia (relatively unknown in the northern USA). Discuss this with your vet. We immunize our adult dogs against this. While some Mexican sites will give you a laundry list of what you need to do to import birds (parrots, parakeets and so on), forget it. Those requirements are for commercial bird importers and may be out-of-date. Mexican consulates generally refer you to a web site for the Paisano program, which often gives incorrect info about bringing your pet birds to Mexico. See the contact person above and look at any other info askance. The one thing that bothers me about taking our birds to Mexico is getting them back into the USA. If you got your birds into Mexico, find out the current regulations about bringing them back to the USA. If you really want to bring your bird to Mexico, flying seems to be the best option. Driving just gives you more opportunities for someone to notice a "T" not crossed or an "i" not dotted. It is because my wife and I did not want to subject our birds to quarantine or to be at the whim of two governments that might change their laws at any moment, that we chose not to move to Mexico with them. After the so-called swine flu scares, birds are even less welcomed. To get your dog or cat back into the USA, you need for their vaccinations to be up-to-date. If they are not, most border crossings have the names of local vets you can call to come and make a 'house call.' In reality, I have never had a tag checked. You can get rabies and other vaccinations in Mexico for practically nothing. You will see some sites claiming that you need a special permit from the Mexican agriculture department. Technically I believe that to be true, but do not know anyone who ever got it. Just for fun, I tried to get one of those a few times. The agriculture guy was not at the two border crossings I tried, ever. I have never, ever heard of anyone getting such a permit. But here is a cautionary note. As you cross from one Mexican state to another, there is always an agricultural inspection station. I stopped at one once (again just for fun) with my god, er dog. The inspector looked at Fluffy and said, I know you have the permit required, so I am going to pass you. The moral is - don't stop at those stations, because if you do, the inspector is supposed to check your pet paperwork. Transporting reptiles within Mexico is quite illegal, so even if your pet serpent is from the USA, you cannot take snakes south of the border. However, the turtle man wrote me and said turtles were okay. Who knows? Maybe the deal is: tortugas, Sí, culebras, ¡No!